Maidana earned his retirement money from that first fight with Floyd, and the second one, but he earned the respect of the fans with a number of other great, great fights. Exiting with a 35-5(31) record, compiled against fair, good, very good and great fighters – none of which were capable of denting his chin and stopping him – Maidana gave fight fans a number of memorable fights and highlights. The tough slugger who never backed down from a war, turned pro in his homeland in June of 2004 and within five years he would challenge for his first world title; dropping a debatable split decision to WBA 140-pound champ Andriy Kotelnik in Germany. In his next fight, the first classic “El Chino” would give us, he ripped the interim version of the same belt with a thrilling, up from the floor stoppage winner over “next superstar” Victor Ortiz. Now a big name in the US, Maidana earned himself big fights against Amir Khan (a close points loss in yet another modern day classic, Khan shocking everyone by being able to take Maidana’s bombs) and Erik Morales (Maidana closing the Mexican veteran’s eye but having to overcome a spirited effort from the legend, winning only via a 12-round majority decision in another action fight). A move up to welterweight saw Maidana drop a dull decision to Devon Alexander in a non-title fight, before Marcos returned to his exciting and winning ways with three stoppage wins on the bounce, beating Jesus Soto Karass, Martin Angel Martinez and Josesito Lopez. Then came Maidana’s biggest, most celebrated win; the 12-round hammering of loudmouth bad boy Adrien Broner. A big underdog going into the December 2013 fight, Maidana decked Broner twice and at times manhandled the flashy boxer who had been dubbed by some as “The next Floyd Mayweather Junior.” Maidana earned a well deserved 12-round decision and with it both the extended thanks of millions of fight fans for shutting up (temporarily, anyway) Broner and, more importantly, a shot at the then pound-for-pound king himself. Mayweather wanted to avenge his then buddy, and Maidana earned by far his biggest ever payday with the May 2014 shot at the welterweight king. Maidana had his share of success against a then 45-0 Mayweather, roughing up the defensive master at times, picking up his share of points. In the opinion of some, Floyd had not been given such a tough fight in a number of years. There was call for a rematch, but this time Maidana was beaten far more decisively on the scorecards. But Maidana was now a multi millionaire and a hero in his homeland. The good times rolled, some serious weight was gained, and Maidana had, as he has now confirmed himself, given all he had to give in the ring. 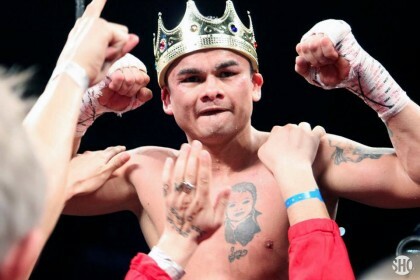 Fight fans are richer for Maidana’s efforts. Did Maidana retire too young, from our perspective, not his own? Imagine the great wars Maidana could have had with the likes of Shawn Porter, Keith Thurman, Jeff Horn and the soon to return Khan in a rematch? Still, Maidana gave us enough and he likely got out at just about the right time. There will be no comeback in this warrior’s case. Nor should there be.